Robert is a Visiting Fellow at Oxford University’s Centre for Technology and Global Affairs, and Chairman of public affairs consultancy Fipra International Ltd. 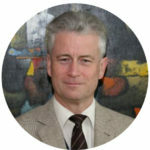 He serves on the Scientific Committee of the recently launched European initiative ‘AI for People’. Robert’s previous career was in UK public service and the European Commission. Robert is the author of ‘Opportunity Now: Europe’s mission to innovate’ (2016).